Orange Turtle, one of my builds for Mobile Frame Zero, meets its intellectual progenitor, the classic Space Turtle by Peter Reid and Tim Goddard. As I mentioned in the first Mobile Frame Zero post, I’m quite taken with Lego Space Turtles, both Peter Reid’s original design, and the slightly redesigned version that shipped with the Lego Ideas Exo-Suit set (semi-review here, link roundup here). They’re fun, easy builds that conjure a lot of character and play value out of a handful of parts. I like Lego, turtles, and space stuff separately, and they’re even better together. This post is a dumping ground for all things Space Turtle. First, the design. Reid’s classic Space Turtle is organized around an octagonal piece, visible in the photo below, to which the legs, head, and tail are attached. A 2×2 round boat plate, mounted upside down, makes the head, with a single eye up front and a 1×1 clip at the back. 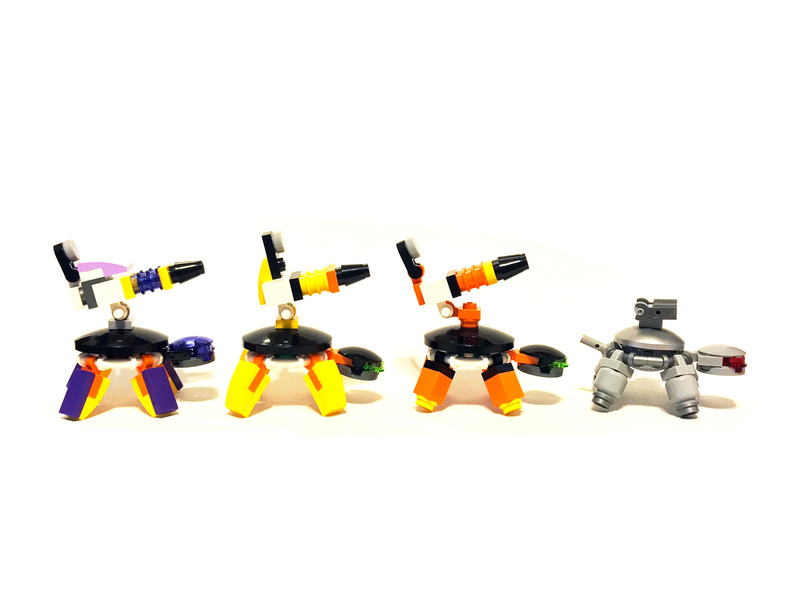 Reid’s original design uses an ‘illegal’ (by the standards of The Lego Group) connection, so for the official release with the Exo-Suit the head was redesigned with a 2×1 clip and two eyes. The classic turtle design uses barrels for the legs, but you can make serviceable legs out of 1×1 bricks or cylinders, or even plates in a pinch, as I’ve done below. Space Turtle tummies. The classic Space Turtle has a boat plate plastron and legs made from fat barrel pieces. My Yellow Turtle has a rocket nozzle instead of a plastron (not equipped in this photo), legs made from plates, and a printed plate from a Lego Dimensions police helicopter for a lower jaw. It also lacks a tail, because I don’t have enough wrench or plier pieces to make tails for all of my turtles. On thing you’ll want for sure is a shell, classically supplied by a radar dish. When I dove into building turtles for Mobile Frame Zero last week, I was just winging it from memory – once you’ve built a Space Turtle, it’s not like you’re going to forget how they go together. I had a bunch of 4×4 radar dishes from our local Lego store’s Pick-a-Brick wall so that’s what I used. It wasn’t until I got out the (excellent) LEGO Space: Building the Future – by Peter Reid and Tim Goddard – and started looking around online that I found that the classic Space Turtle uses a 3×3 dish. In comparing my hacked design to the original, I think the original looks a little more robotic, because the smaller 3×3 dish exposes more of the mechanical structure of the model. But they’re both immediately recognizable as turtle robots, and I reckon that’s what counts. Aaanyway, I bring up all of this noodling over parts because there are a couple of polybag sets on store shelves right now that have almost all the pieces you need to build variant space turtles. First, you’ll want the 30404 Friends flower polybag, which has two of the octagonal central rings, and about a zillion clips, 1×2 plates, jumpers, and little slopes for making plate-based legs – The Mobile Frame Garage reviewed that set here. Next, pick up the 30525 Guardian’s Ship polybag, which has a bunch of cool and useful pieces, but most importantly has some 2×2 round boat plates for making Space Turtle heads. Mobile Frame Garage also reviewed that set, here, and even mashed it together with the Friends flower polybag here. If you just want to get started with Mobile Frame Zero and don’t absolutely have to have Space Turtles, that set combo is great, because you can build two frames and a station for under ten bucks. 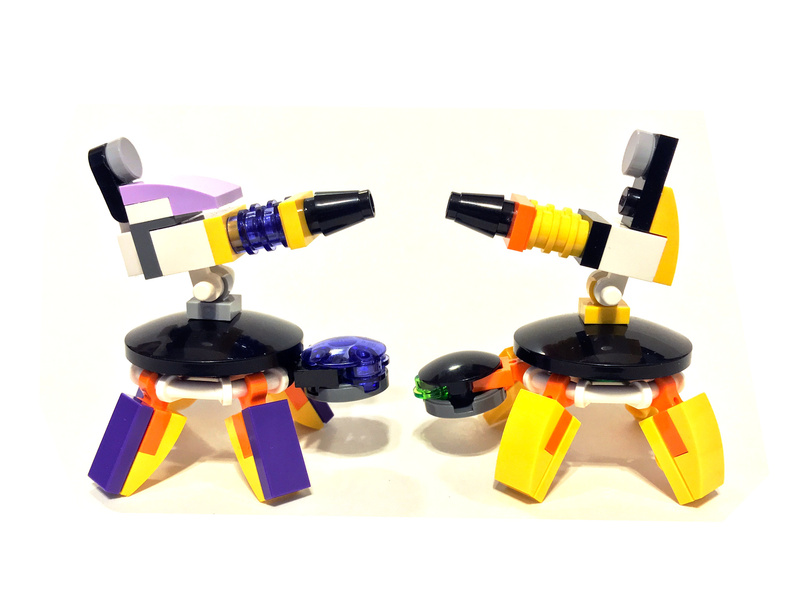 Purple Turtle and Yellow Turtle show off a couple of different ways of building legs from the pieces in the Friends flower polybag set. The heads and guns incorporate parts from other sets. I will build some turtles soon using only the parts from the flower and Guardian’s Ship polybags (plus radar dishes for shells), and post the results. I said those two sets have almost all the parts for Space Turtles because neither one has radar dishes. London and I just got a mess of radar dishes from our local Lego store, or you could get them on Bricklink or some other online parts dealer. Incidentally, we found the Friends flower polybag in the toy section at Wal-Mart, and the Guardian’s Ship polybag in the checkout aisle at Target. I was out running errands today and picked up a few extras – gonna build some Space Turtle kits for my nieces and nephews. I’m going to close with a link roundup. The original home of the Space Turtle, and still the place to go for awesome new variants and truly insane weapons attachments, is Peter Reid’s Flickr stream, legoloverman. “Turtle with Missile Launcher”, linked from Peter Reid’s Flickr stream, and copyright Peter Reid. The good folks at New Elementary have a bunch of Space Turtle posts, including the authoritative “History of the Space Turtle” post, which lives up to its name. Other posts of interest cover turtle weapon variants, magenta turtles, and Liberty turtles. 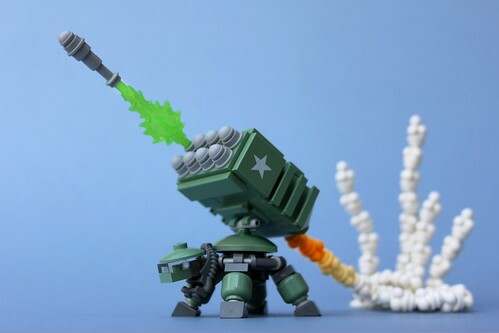 The above shot of a “Liberty launcher” firing – another Peter Reid creation – is one of the coolest Lego builds I have ever seen, bar none. 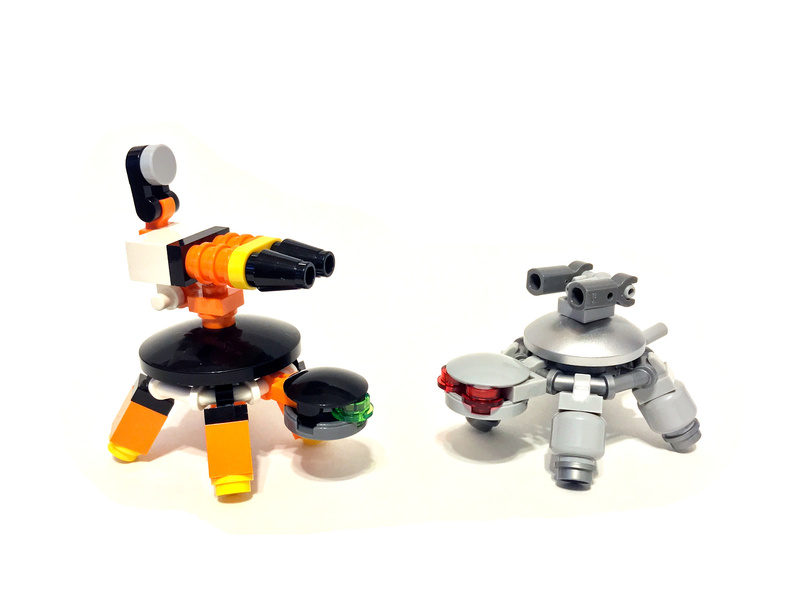 A couple of cool variant turtles that don’t use radar dishes for shells are the BlackTron Special Forces Heavily Armored Turtle by bricksflickr and the Black Mech Turtle by crayonbricks. If you know of a Space Turtle link I should have included here, sing out in the comments and I’ll add it. UPDATE: Since Luc Byard invented the Blacktron Rectifier specifically to take out Space Turtles, it seems wrong not to mention it. Find the original post, a parts list, and instructions on Luc’s Flickr. Discovered through The Brothers Brick. March of the Space Turtles: my hacked versions, showing off three variant leg designs, follow their leader. Other than Peter Reid’s Liberty Launcher photo, all of the photos in the post are by me. I’m releasing them under a CC-BY 4.0 license, so feel free to reuse them however you like, as long as you credit me. This entry was posted in Lego, MOC, Space Turtle. Bookmark the permalink. 1 Response to Space Turtle, Space Turtle, SPACE TURTLE! !